Both Angular 2 and .NET Core have been RTM for a little while now. So I've been keen to get them working together. There are plenty of examples online of how to create a .NET Core Web API and have an Angular 2 SPA talk to it. That's great, however not all Web Applications are SPAs and a lot of organisations wont re-write their applications just to reap the benefits of Angular 2. At the time of writing I couldn't find any examples of integrating Angular 2 into a new/existing MVC page. you will be able to get "most of the way" through this guide, however you'll need the "NodeJS bits" that I will be stripping out (as VS auto runs some NodeJS commands for us). I'm going to show how you can take a section of your MVC page and have Angular 2 control content in that! Without having to re-write your server-rendered web app to a SPA. 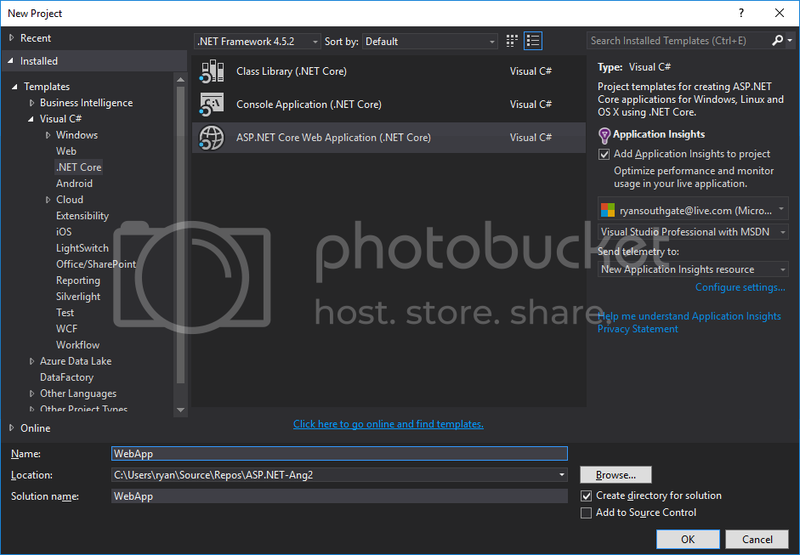 For the purposes of this demonstration I'm going to start off with a new ASP.NET Core project. 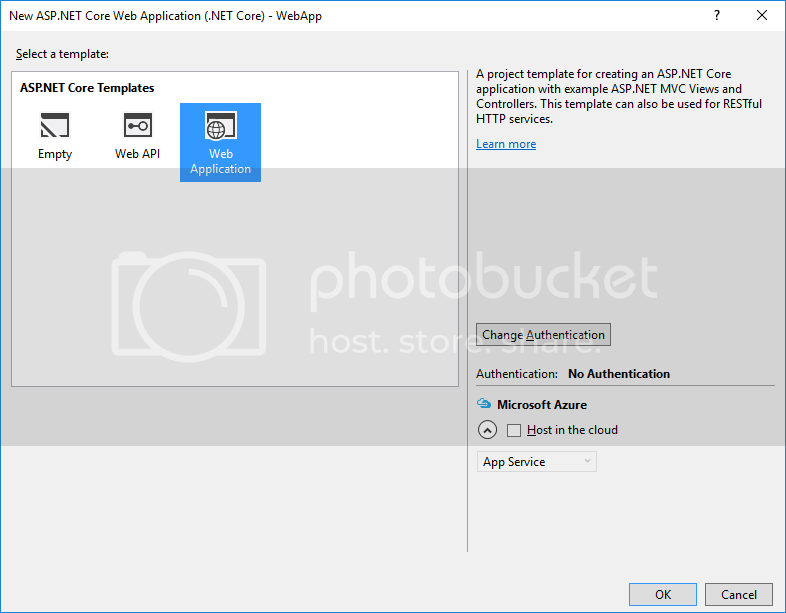 Create a blank ASP.NET Core MVC project. Good job! We now have an empty MVC application. To get hold of a package.json file, you'll need to Right-Click your Project, then choose Add > New Item, you're now looking for npm configuration file as below. 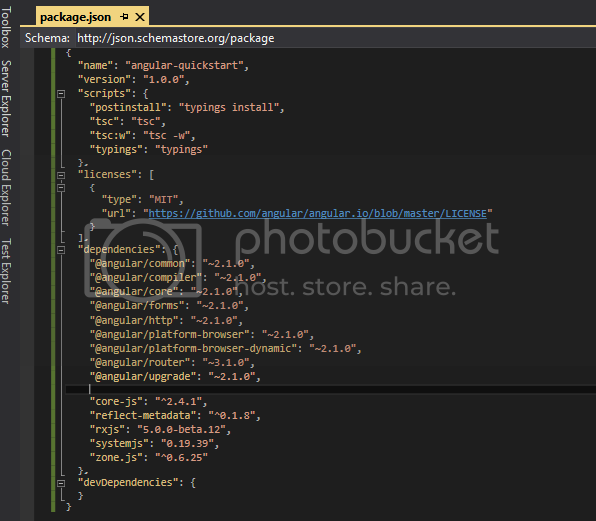 Click Add and we now have a package.json in the root of our Web Application. You'll need to create your own or borrow the quickstart "seed" tsconfig.json file. Take a copy of tsconfig.json. If you're using external typings, create or borrow a typings.json file. Make sure the files are new .json files in the root of your project. The tsconfig.json is TypeScript Configuation - this allows us to set a bunch of options for our TypeScript compiler. e.g. It can allow you to be more/less strict on the TypeScript you write. Choose the package.json tab and take a copy of the text inside! (there's some faff in here that we wont be needing because we're using Visual Studio so we'll strip that out). UPDATE: copy the package.json from here or alternatively, run the Angular-CLI (this seems to be the way the Angular team want you to go) from here then copy/paste the package.json into your project directory. You could run the Angular-CLI commands in your project directory, however it installs a node server and a lot of other stuff we wont need - since we're using .NetCore. Make sure you reference the latest version of Angular (and it's components) in the package.json. First off we don't need anything referencing "lite-server" - we're not going to be using NodeJS as a web server. So get rid! Second, remove everything in "devDependencies" - Visual Studio will be taking care of TypeScript transpilation so NodeJS needent care. Lastly, I'm not going to be using "bootstrap" or "angular-in-memory-web-api" so remove those too! 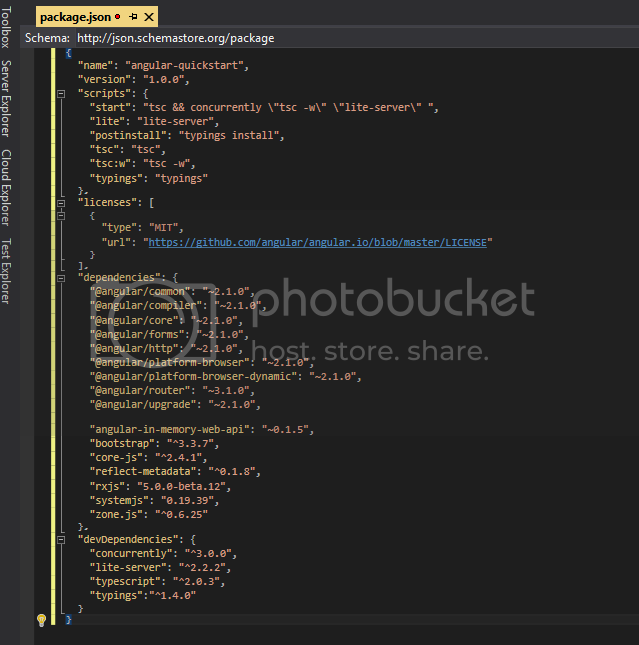 Save the file and Visual Studio will run "npm install" for you which will install all the pacakges and typings. You should see a "typings" folder appear which indicates the "postinstall" script has run successfully. I've put SystemJS in a folder all on its own in the project root and put the systemjs.config.js file inside. I'm trying to keep this post reasonably light so we're only going to get a very very simplistic Angular 2 example working. Create a folder in the project root called "app" - in here we're going to put our Angular 2 TypeScript files. Having a quick read through the Angular 2 code, most of it is the "boiler plate" you get from the Angular 2.io website. All I've done is defined a new component called Searchbox and told my app to load it. Searchbox defines a keyup.enter event and sends that to the displayAlert() function in the SearchBoxComponent class. Lastly we need to include the Angular 2 application on one of our pages, I've stuck the <my-app></my-app> declaration in the Index.cshtml page for now. 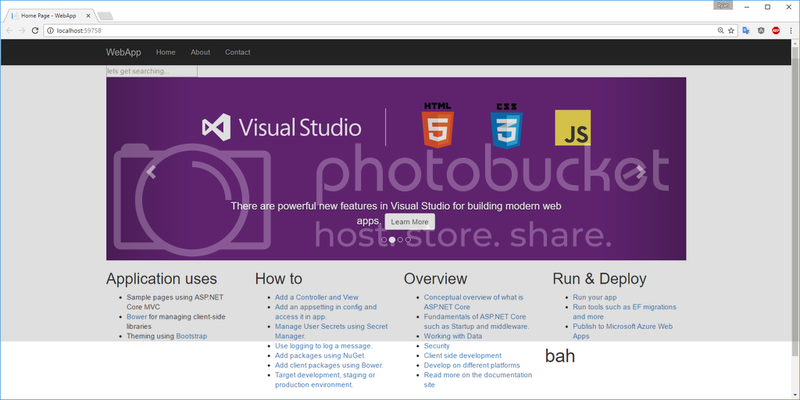 If you're using Visual Studio then you're in luck! It takes care of TypeScript compilation automatically. The important parts being rootDir (where the actual .ts files are) and outDir (where you want the compiled files to go). I've also set compileOnSave to true this will mean that I can make a change to a TypeScript file, save, refresh the browser and see my changes. I'm going to use Gulp to move files around when building the project. Note you could use Grunt, npm-scripts or even XCOPY - remember use what YOU'RE comfortable with and what suits YOUR needs! Save that and copy/paste the below code. 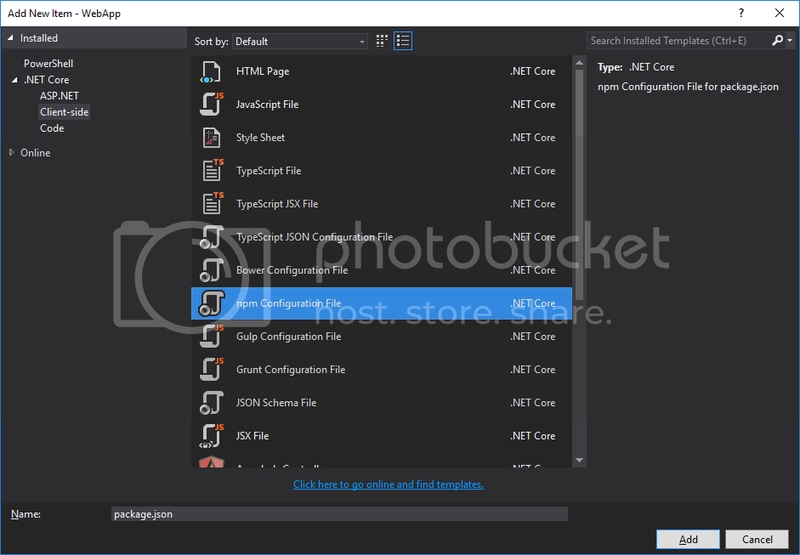 The first line of the gulpfile is a Visual Studio Directive which says "before you run a build, run the gulp task 'beforeBuild'"
Copy/paste the following SystemJS config file - I've added comments to the file again to give an overview of what things are. Spotted the text box at the top of the screen?! It's not pretty, but that is the foundation of getting Angular 2 running within ASP.NET Core MVC. Server side rendering of our page content works, and it's great for SEO, but sometimes you need a section of the page to be more "dynamic", e.g. it might fetch content from the server or perform polling and display results. A full-page refresh for those instances are extraneous. Shout at me on Twitter/Comments below on what you'll be building now you can use Angular 2 and ASP.NET Core MVC together. Also let me know if you have any improvements/criticisms......we're all here to learn!